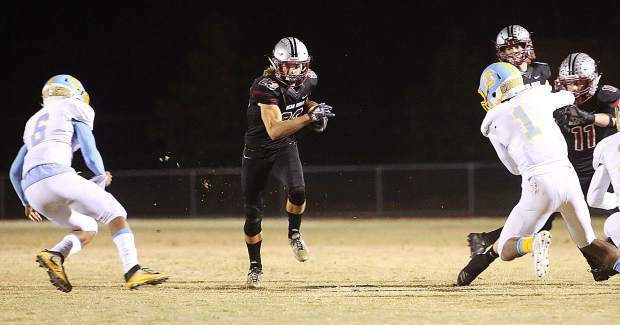 Bear River senior fullback Hunter Daniels (34) rushed for 113 yards and three touchdowns, helping the Bruins to a second round playoff win over Center High School Friday night. Bear River wide receiver Dylan Bergez-Scott catches a long third down pass at the 1-yard line to set up the Bruins' first score of the game. Bear River senior Dylan Bergez-Scott deflects a pass intended for a Center High School receiver during Friday's playoff win over the Cougars. Tre Maronic pushes through the Center defense during a run early on during the Bruins 28-13 win over the Cougars at home Friday. Bear River coaches celebrate a hard fought win over the Center Cougars. 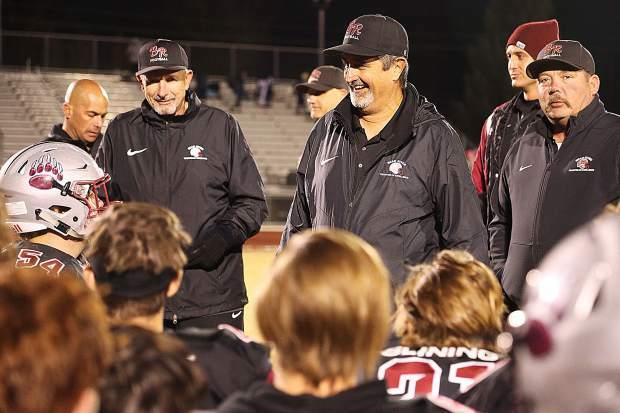 Calder Kunde (middle) and the Bear River Bruins advanced to the Sac-Joaquin Section Division V semifinals after knocking off Center, 28-13, last Friday. 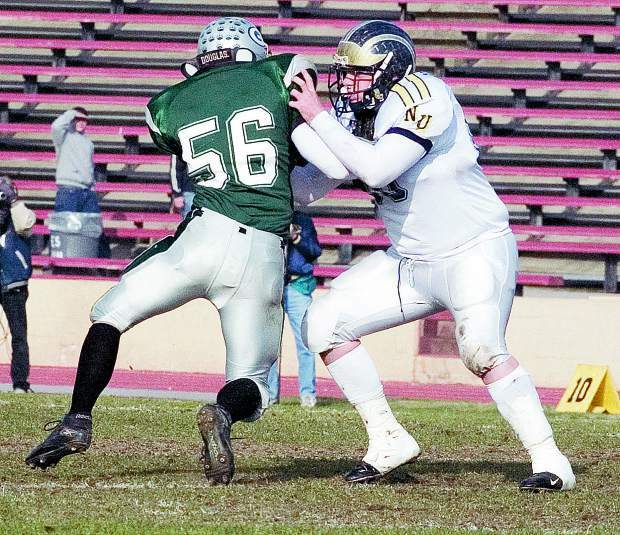 The Bruins, along with 25 other teams from around the section, are still in the hunt for one of seven section a title. Austin Slining puts pressure on Center High School quarterback Michael Wortham during Friday's playoff win over the Cougars. Calder Kunde catches the deep pass from Tre Maronic, before being pushed out of bounds by a pair of Center defenders. Tre Maronic throws a deep pass to Calder Kunde during second half game play against the Center Cougars. The Bear River varsity football team leaves the locker room during the half against the Center Cougars tied 7-7. 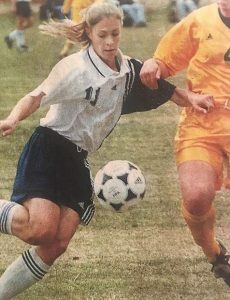 The Bruins would go on to win 28-13. 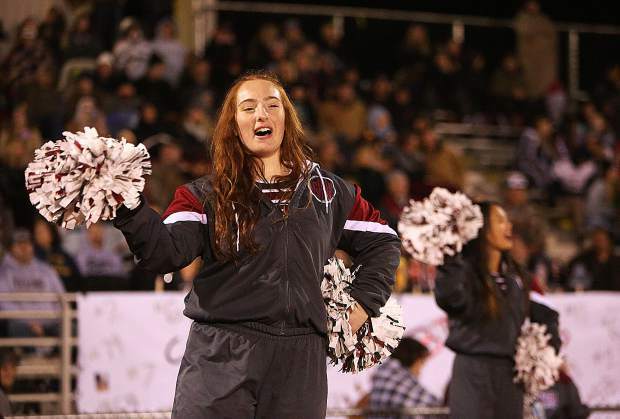 The Bear River cheerleaders kept fan and player spirits high when temperatures dropped during Friday night's playoff game against the Center Cougars. 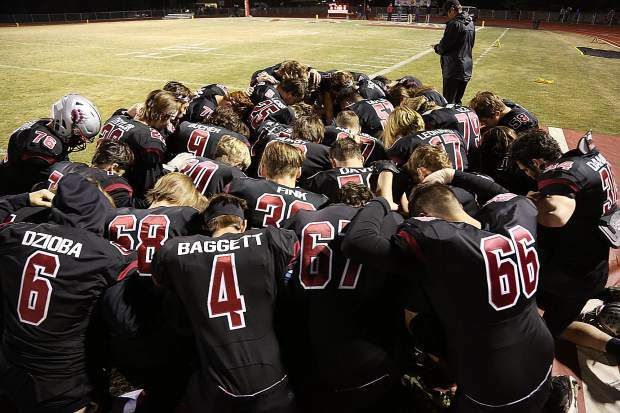 The Bear River varsity football team prays before taking the field against the Center Cougars Friday night. 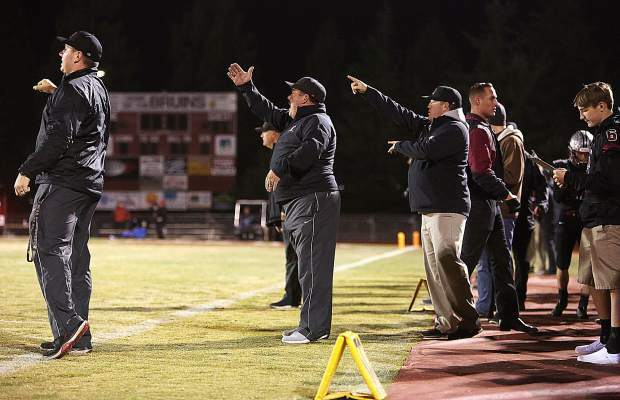 Bear River's coaches instruct the team from the sideline during Friday's playoff win over Center. Bear River wide receiver Dylan Scott catches a long third down pass at the 1 yard line to set up the Bruins' first score of the game to put them up 7-0 after the extra point. 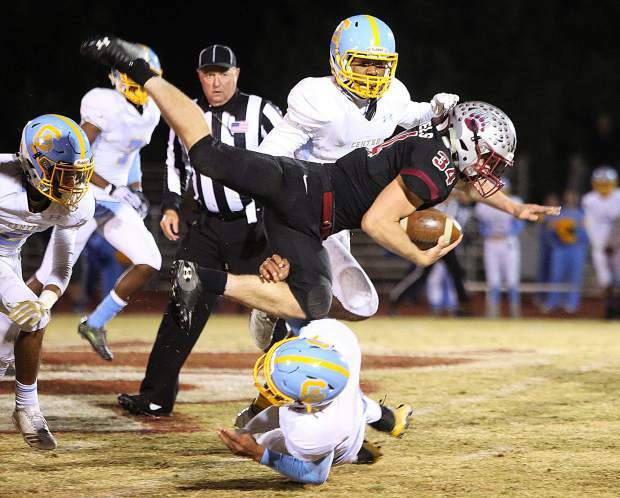 Bear River 5'11" senior Hunter Daniels, hurdles a Center High School defender during the Bruin's playoff win over the Cougars Friday night at Bear River High School. 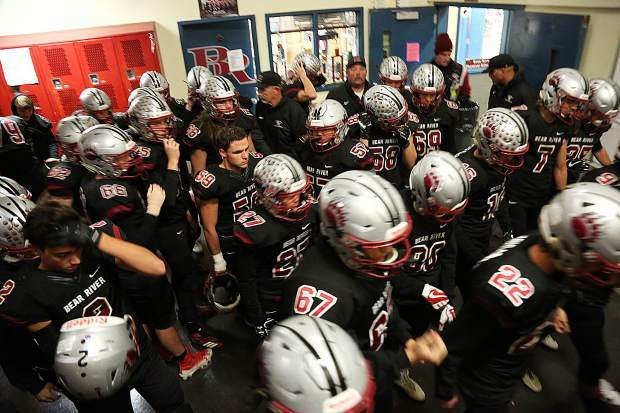 The Bear River football team was all business Friday night as they took a big step toward defending its Sac-Joaquin Section Division V title. Playing in frigid conditions at J. David Ramsey Stadium, the No. 3 seed Bruins put the No. 6 seed Center Cougars on ice with a gritty 28-13 win to advance to next week’s semifinals. 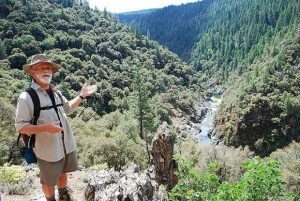 And, there was no stopping the Bear River attack when it mattered most. Ahead 21-13 with about three minutes remaining, the Bruins faced a third-and-15 from their own 40 yard line. 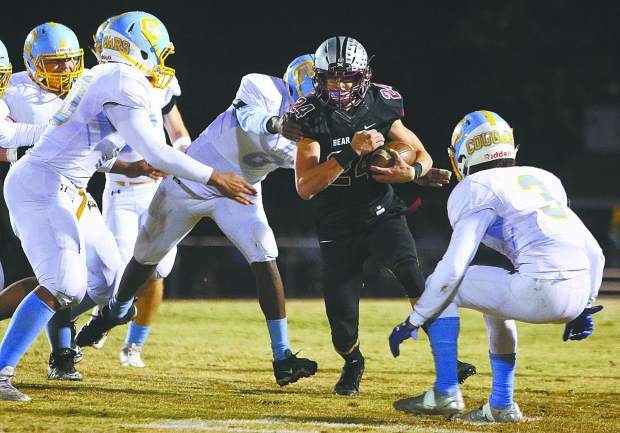 In a role reversal, junior running back Tre Maronic dropped back to pass and found senior quarterback Calder Kunde for an incredible 34-yard reception to move the chains and keep the clock ticking. Three plays later senior fullback Hunter Daniels blasted through the middle and high-stepped his way into the end zone from 18-yards out for his third score of the game, putting a final exclamation point on a hard-fought victory. Sharing the success out if the backfield was Maronic, who powered his way for 61 yards on 16 touches, followed by Kunde, who tallied 32 yards on eight attempts. 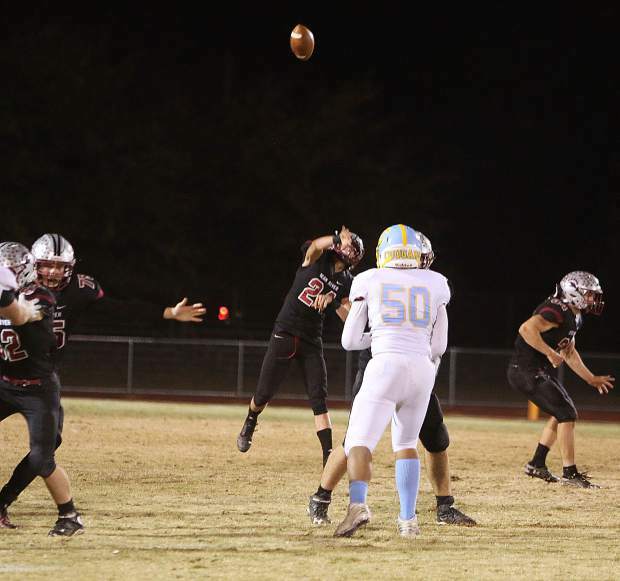 Through the air, the Bruins were three-fold, with Kunde completing 6-of-15 for 94 yards and a score, followed by Colton Jenkins, who finished 2-of-2 for 45 yards and Maronic, whose 34-yard completion put Center on the ropes. Bergez-Scott led the Bruins in the receiving department with six grabs for 124 yards. 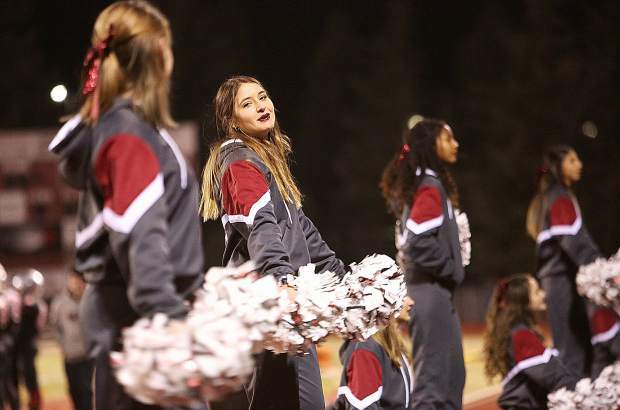 Bear River never trailed at any point in the contest, scoring first on its opening drive, going 67 yards on 12 plays, capped with a 1-yard plunge by Daniels. 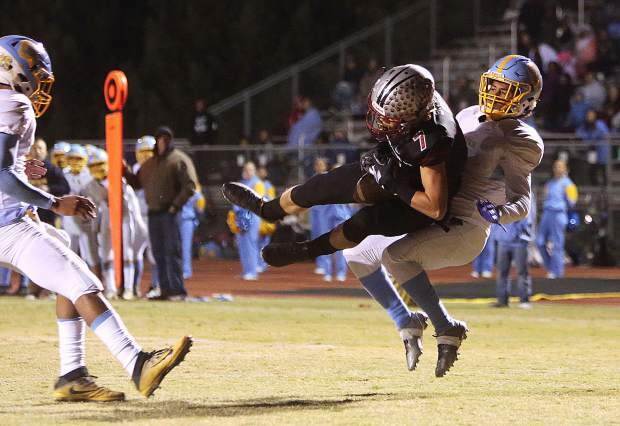 The Cougars would knot things up at 7-7 in the closing minutes of the first half when senior halfback Elias Bonds busted loose for a 61-yard scamper to the house. Coming out strong in the third quarter, The Bruins blocked a Center punt to set themselves up with great field position. After working the ball down inside the 10, the Bruins faced third-and-goal from the 2-yard line. Kunde sold a beautiful fake handoff up the middle and turned out of the pocket to find a wide open Josiah Cregar for the score and a 14-7 lead. On Center’s ensuing possession, the Bruins forced the Cougars out of their comfort zone and into a third-and-long. 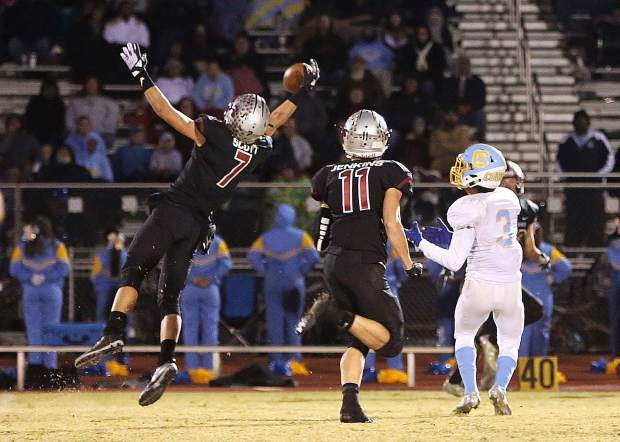 That’s when Bear River’s Bergez-Scott came away with a key interception. 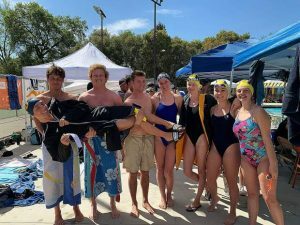 Mixing in runs from Daniels, Kunde, Maronic and Clayton Anderson, it was Daniels who eventually ended the 60-yard drive by pounding his way in for a 2-yard score and a seemingly comfortable 21-7, two-score cushion. Center wasn’t ready to pack it in though, and answered right back with a 57-yard touchdown run by quarterback Michael Wortham to pull the Cougars back to within a score at 21-13. The point after was no good and the Bruins offense would grind it out from there. 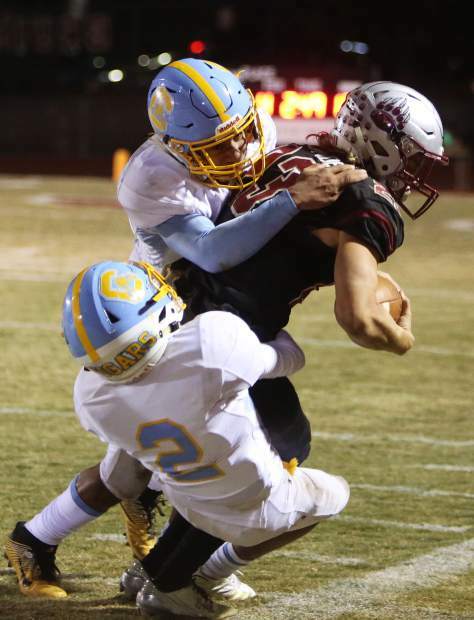 Outside of Center’s two big scoring plays that totaled 118 yards, defensively the Bruins held the Cougars to 50 yards rushing on 17 attempts and just 5-of-11 passing for 52 yards with an interception. 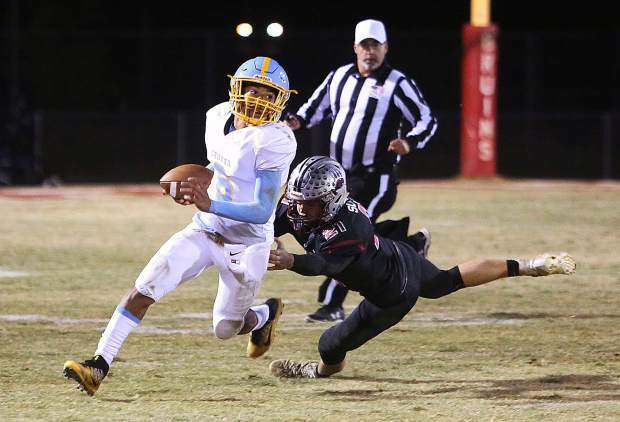 Senior Trae Nix led the Bruins with 11 tackles, followed Daniels with 10, Sam Davis with six and Austin Slining with five. Warren Davis took down Center’s Wortham for a big 10-yard sack. Next up for Bear River (10-1) is a road bout with No. 2 Ripon, who throttled No. 7 Mountain House 49-20. Also posting wins in the D-V bracket were No. 1 Colfax defeating No. 8 Los Banos, 56-21, and No. 4 Sonora edging No. 5 Foothill, 28-27. Colfax and Sonora will square off in the other D-V semifinal.